'Tis the season to be jolly and this is my way of spreading some Christmas Cheer. 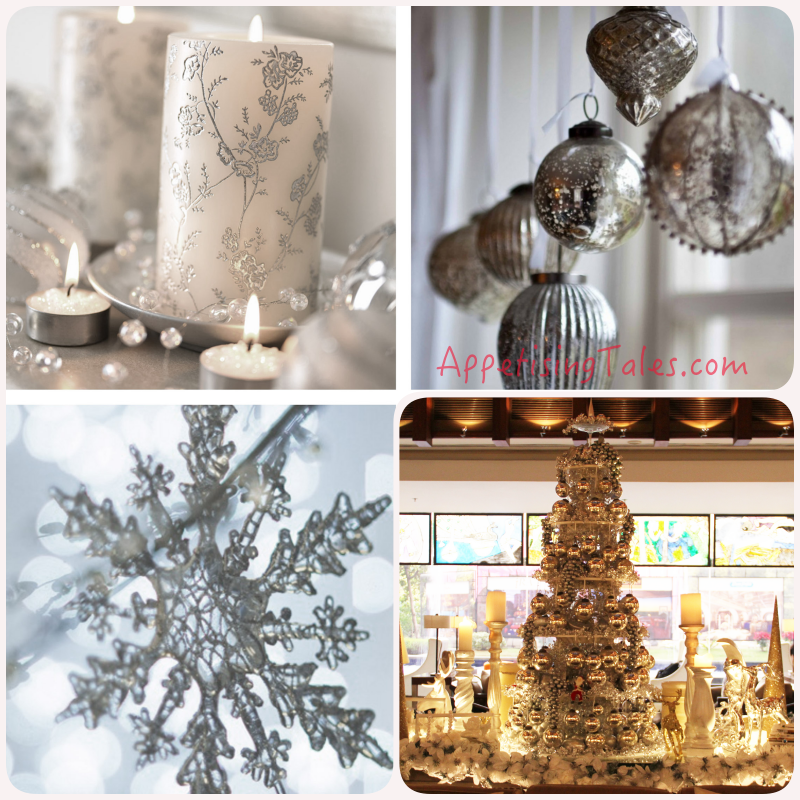 Here are a few glimpses into how hotels are decked up for the festive season. 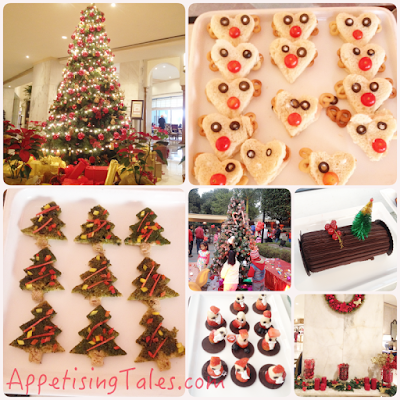 I am also sharing details of some scrumptious christmas brunches. Merry Christmas! Christmas Banter at The Imperial. Christmas started early for me with The Imperial hosting a delightful Christmas Banter. The outdoor tables at San Gimignano were laden with all the goodies including stollen, plum pudding, mince pie, yule log, sandwiches, quiches and more. 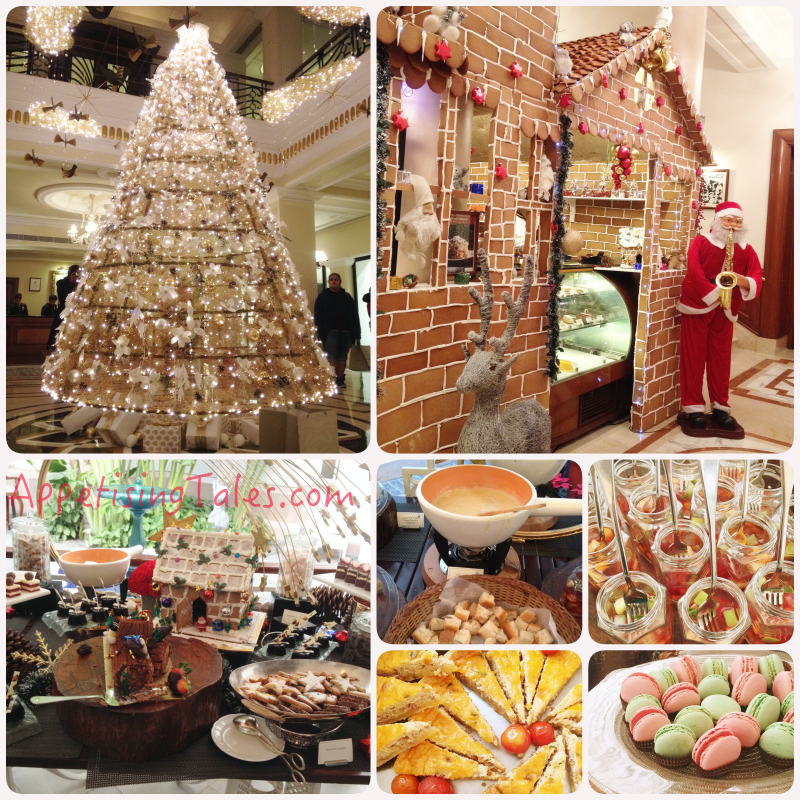 You too can indulge in these treats, as they will be available at the French Patisserie, La Baguette, till the end of December. An interesting Christmas Quiz and Chef Prem Kumar Pogakula's demonstration of 2-minute mug cakes were quite the highlight (ping me if you want any of the three recipes - Chocolate Mug Cake, Peanut and Walnut Mug Cake and Coffee and Cashewnut Mug Cake. I'll be happy to share.) And the best part? We all got to take home a delicious gingerbread house filled with cookies, plum pudding and more cake! 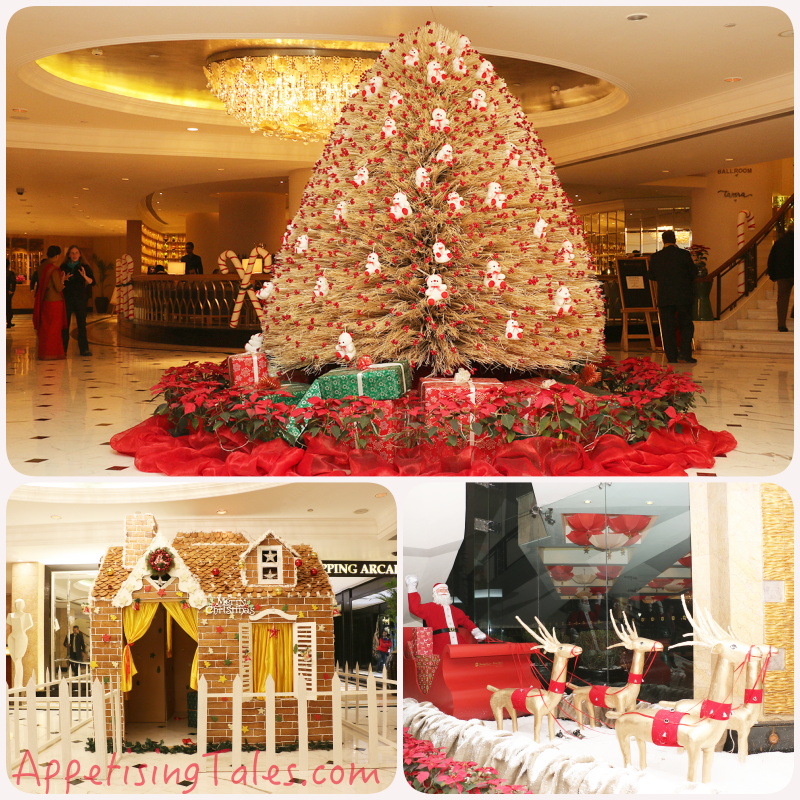 Christmas Carnival at the Taj Palace Hotel. With activities including decorating the Christmas tree, icing cupcakes and gingerbread cookies, colouring cards, coordinated games and sandwiches and desserts in the shape of mini christmas trees, reindeer and santa claus, the Christmas Carnival at the Taj Palace Hotel was a treat for kids. 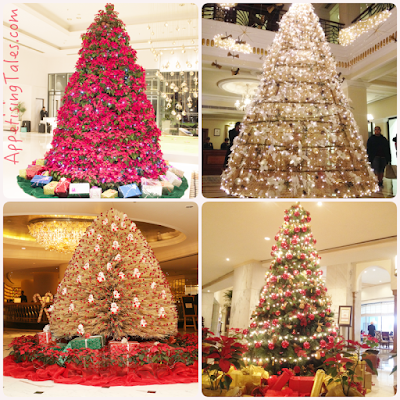 Christmas Tree Lighting at Shangri La. The Annual Christmas Tree Lighting at Shangri-La's - Eros Hotel, New Delhi was kickstarted with a treasure hunt for tiny tots to look for the switch to turn on the magical lights. Then Santa Claus trudged around distributing goodie bags amidst carol singing. But isn't Christmas incomplete without the joy of giving? The hotel's team took care of that too. Guests were encouraged to adopt the hotel's festive ambassador, Baby Bear for Rs 300 each. The funds collected are being donated to the Noida Deaf Society a partner in Shangri La's - Eros Hotel New Delhi's Care for People Project. Le Meridien Gurgaon's pretty poinsettia tree. 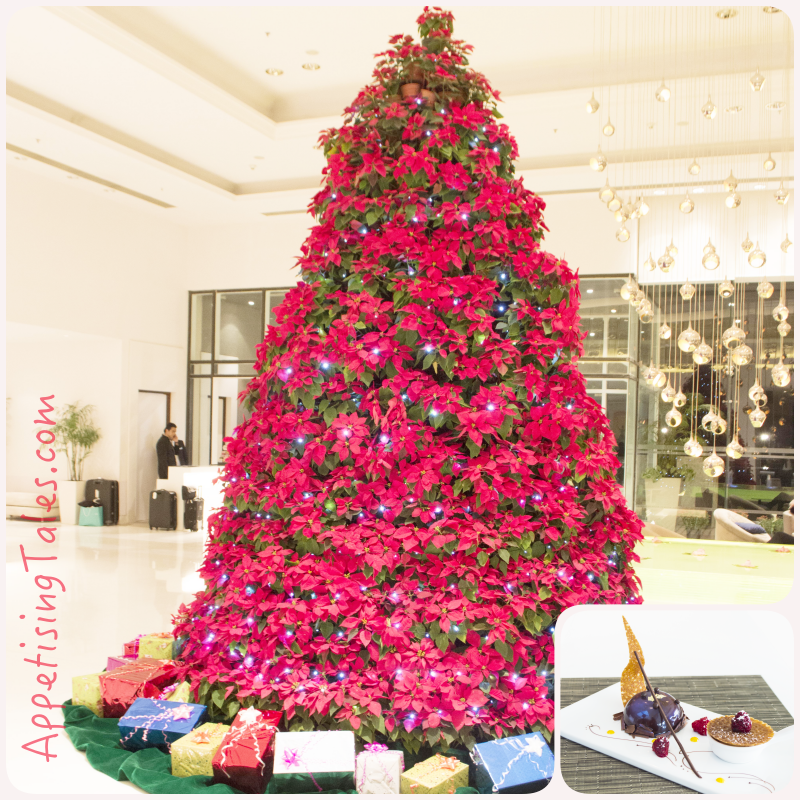 The Hub at Le Meridien Gurgaon has donned a festive look with 600 potted Poinsettia plants that have made a stunning Christmas Tree. 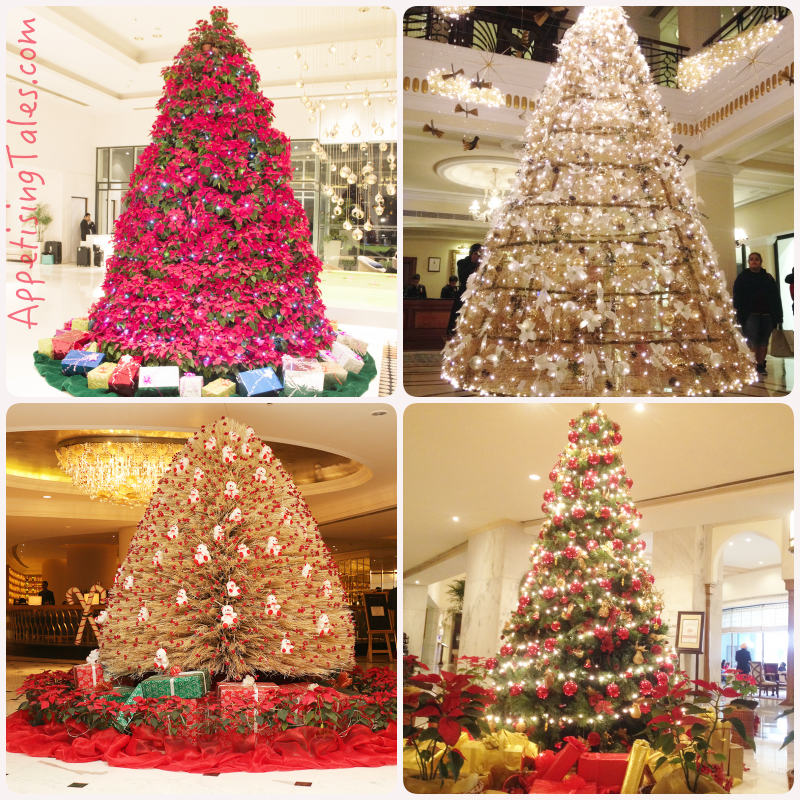 Executive Housekeeper Bhupinder Rawat decided to use these plants since they are popularly used for Christmas decorations and also to keep up with the hotel's commitment to the environment. 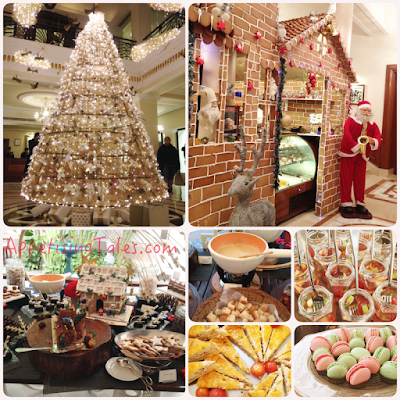 There will be a festive dinner buffet and brunch buffet on the 24th and 25th, respectively. Featuring over 200 dishes, these buffets are priced at Rs 2,450 (plus taxes) without alcohol and Rs 3,250 (plus taxes) with alcohol. 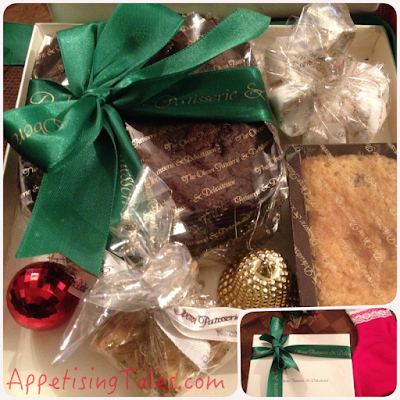 Xmas goodies from The Oberoi. I know the above is not the picture of a fancy tree. But it is the delicious plum cake hamper sent across by The Oberoi New Delhi. I have to confess that I get transported to Christmas heaven having a warm slice of this rich fruit laden cake with homemade mulled wine every other day. ('Tis also the season to indulge!) The Christmas Eve Buffet and the Christmas Day Brunch at threesixty both come at Rs 5,950 (plus taxes) but the hefty price tag will be worth every penny since the five-course set menu prepared by the in-house Italian masterchef comes accompanied with free flowing champagne, wine, mulled wine, eggnog and other festive cocktails. White Christmas at ITC Maurya. The ITC Maurya showcases classic elegance with a pristine white decor as the ITC Hotels is celebrating a White Christmas at all their properties. "Marking the end of the darkest night of the year, Christmas celebrates the return of light, hope and fresh beginnings," reads their Christmas poster. Amen to that! For Festive Indulgences, go for chestnut and cranberry roast turkey, oysters, honey mustard minced pies and much more at festive buffets on 24th eve and 25th day, starting at Rs 2,500 at The Pavilion. Or head to WestView where the highlights include roast butterball turkey with chestnut stuffing and side of rosemary roast potatoes, ginger glazed carrots, roast parsnips, bisto gravy and cranberry sauce, starting at Rs 3,450. These are but a few glimpses that I have been part of. You will be spoilt for choice from many others. For non-5 star options, I would pick between Diva and Elma's. While the former also has a specially curated Christmas spread, the latter has the traditional turkey, beef Wellington, rosemary lamb roulade, salmon fillet, and baked camembert among other delicious fare, starting at Rs 1,700. So, go, make merry, and indulge in this festive season!